We work closely with struggling families to provide support, education, and connections to resources and services that best meet their needs. children and their parents are stronger, safer, and more stable each year thanks to our programs. of participating parents feel more confident in their parenting skills. of the children participating are on track in their motor and social/emotional skills. 85% of a child’s brain development occurs before they are five. Yet children born into poverty often do not have access to the physical, emotional, or cognitive support they need to grow up and lead healthy, happy, productive lives. We support parents caught in an inter-generational cycle of poverty. Our programs promote healthy development, and school readiness for children. We help parents provide consistent nurturing to their children and build supportive connections in their communities. Parent-Child Therapeutic Services works to reduce the effects of domestic violence on children by strengthening the parent-child relationship. Early Childhood Fathering Project consists of weekly father-child interaction groups, and monthly workshops and outings, working to increase fathers’ confidence, competence, and to connections with other dads and their community. Healthy Families consists of home visits to families with newborns. We provide information, screenings, and resources on child development and infant care. Parent-Child Development Services provides fun, interactive classes for parents and children aged three to five. Parents learn about topics such as child development and positive parenting skills. Safe & Together works with families with children ages birth to eight who are in foster care. Our goal is to reunite families and prevent future occurrences of foster care placement. Please call our Early Childhood program at (503) 721-6777 to learn about our range of services. Your conversation will be completely confidential. 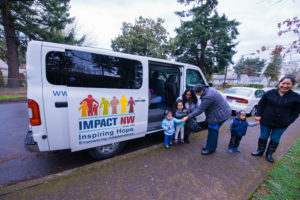 If Impact NW isn’t the best fit for you, we’ll help connect you to the services you need. 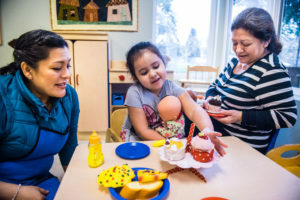 Our programs use the guiding principles developed by the Parent Accountability Council of Early Learning Multnomah to shape our work with children & families.